It's Wednesday again, so it's time for me to share another card here at One Crazy Stamper and this week I have the adorable Harp Angel from High Hopes rubber stamps. The image was stamped on to Copic Xpress It cardstock, and then colored with Copics. A touch of Wink of Stella clear on her wings finish off the image. I then fussy cut the image, and placed it on a card front made with My Favorite Things paper, and a My Favorite Things sentiment. 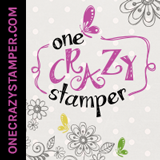 Be sure to check out the rest of the design team divas fabulous projects at One Crazy Stamper!